These large Halloween Decor Wood Boo Blocks really stand out in your Halloween and Fall decorating displays! 🕷 Cut from 2" thick pine and freestanding . 🕷 Each Block is 5" wide and range in height from 5-9" tall! 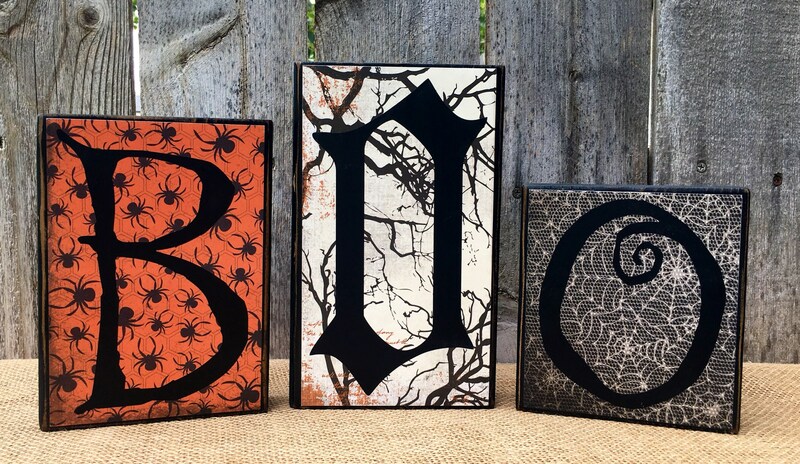 🕷 They are painted black and finished with sealed scrapbook paper, and vinyl lettering. 🕷 These can also be finished in a dark Walnut Stain instead of the black paint if you prefer. Well made, solid, exactly as pictured. Will be decorating my windows with these for many halloweens to come. Packed well, shipped quickly. Would buy again.